Are you ready for the Super Bowl? Come join us on Saturday, Feb 4 from 7AM to 3PM at WD Muhammad Masjid (6641 Bellfort St, Houston, TX) as we take advantage of the moment and participate in We all win..Championship Weekend. 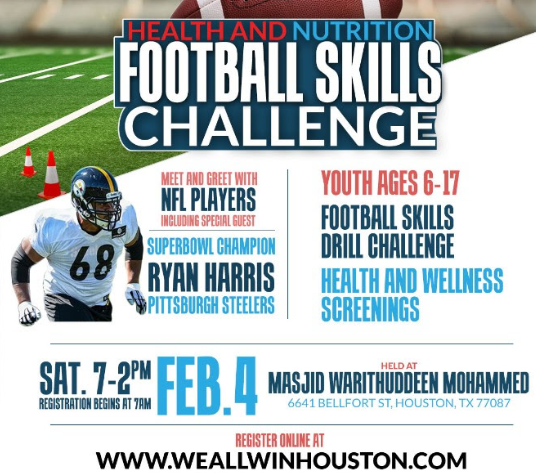 Organized by Kamp Khalil, the event aims to educate youth (ages 6 to 17) and their families in the Houston Third Ward about the importance of health and fitness through a Football skills Challenge.InshaAllah, Troop 713 scouts will assist with setting up, distributing information, and cleaning up.But that’s not all, boys will be able to participate in the various football competitions to test our their skills. Click here to volunteer for the event!